As leading tour operators in Sri Lanka, we provide you with the best options of visiting the most beautiful water falls of Sri Lanka. There are many to select from, and we can help you in selecting the right ones which are at closest destination from your place of stay. Holidays spent in Sri Lanka would be one of the best for nature lovers. This tropical island is blessed with some of the most stunning waterfalls and is home to over hundred water falls with Dunhindha, Diyaluma, Bopath Ella, Aberdeen etc. to name a few. Many of the waterfalls are hidden away in the thicket of forests and require a trek to the interiors. However, there are also a number of water falls which are easily accessible and remain suitable bathing spots. Travel in Sri Lanka with Classy Tours would help you attain a tailor made itinerary to suit your comfort and needs and help you achieve a pleasant stay in Sri Lanka. Bambarakanda is the highest waterfall in Sri Lanka with a sheer drop of a 263 meters. 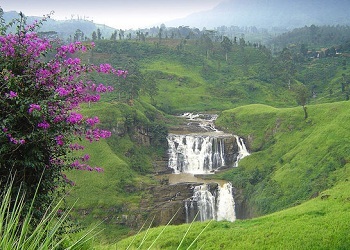 Situated in Kalupahana in the Badulla District. The area around Bambarakanda is rich with scenic beauty, rugged terrain, waterfalls, tea fields and cool climate making it an attractive destination for nature lovers. 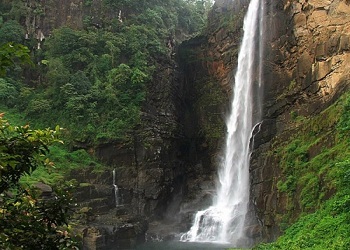 Diyaluma Falls is 220 m (720 ft) high and the second highest waterfall in Sri Lanka. It is situated 6 km away from Koslanda in Badulla District on Colombo-Badulla highway. Features a cascade of water falling in a single slender streak into the wooded valley below. These magnificent falls are fed by the water of the Punagala Oya. You can walk to the top of the waterfall following a one-kilometre path that begins from a small rubber factory by the side of the road. On reaching the top you will be rewarded with breathtaking views and the chance to have a refreshing dip in the rock pools to be found there. 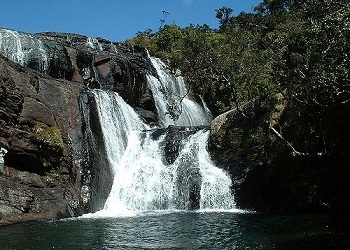 Dunhinda is considered to be one of the most enchanting falls in Sri Lanka. Dunhinda Falls is located about 5 kilometres from Badulla town in Sri Lanka. The waterfall, which is 64 metres high gets its name from the smoky dew drops spray, which surrounds the area at the foot of the waterfall. To reach the water fall you have to walk more than 1 kilometre along a foot path. Along this foot path you can see another small waterfall called Kuda Dunhinda at a distance. 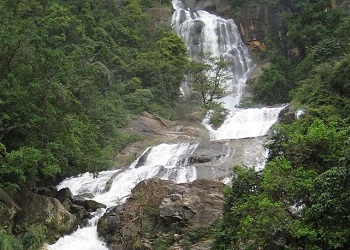 The Ravana Falls (popularly known as Ravana Ella) is a popular sightseeing attraction in Sri Lanka. It currently ranks as one of the widest falls in the country. Which is situated at Badulla district closed to Near Ella place. This waterfall measures approximately 25 m (82 ft) in height and cascades from an oval-shaped concave rock outcrop. 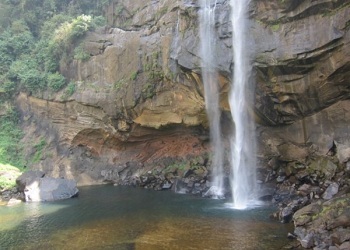 Baker's Falls is a famous waterfall in Sri Lanka. It is situated in Horton Plains National Park on a tributary of the Belihul Oya. Bakers waterfalls at between Entrance and Worlds end gap of Horton plains. Bakers is not a single waterfall and it consist several parts. Above area of the Bakers waterfall is like big tank. Bathing of Bakers waterfall is very dangerous because there are some caves inside water. 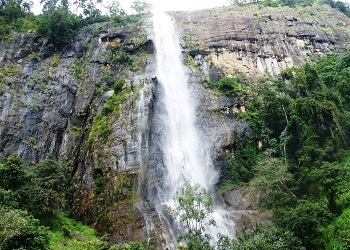 Ramboda Falls is 109 m (358 ft) high and 11th highest waterfall in Sri Lanka and located by the Pussellawa. Sometimes two tributaries of the same river may form twin waterfalls very close to each other as the water spills down cliffs and rocks. However, it is quite uncommon for the tributaries to combine after forming the waterfalls making a Y shape. 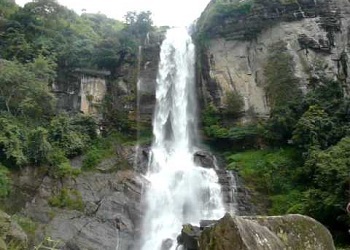 Devon Falls is situated 6 km west of Talawakele, Nuwara Eliya District on A7 highway. The falls is named after a pioneer English coffee planter called Devon, whose plantation is situated nearby the falls. The Waterfall is 97 m high and ranked 19th highest in the Island. 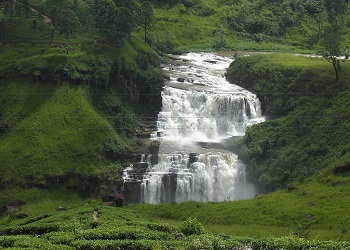 The Falls formed by Kothmale Oya, a tributary of Mahaweli River. Bopath Ella is situated in the Ratnapura District of Sri Lanka. It has a shape very similar to the leaf of the Sacred fig or "Bo" tree, which has earned it this name. Bopath Ella is 30 metres (98 ft) high. It is formed from the Kuru Ganga, which is a tributary of the Kalu Ganga. 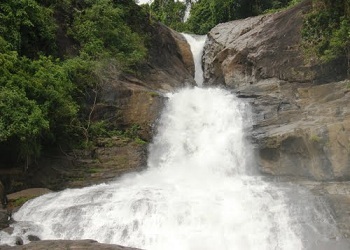 St. Clair's Falls is one of the widest waterfalls in Sri Lanka and is commonly known as the "Little Niagara of Sri Lanka". 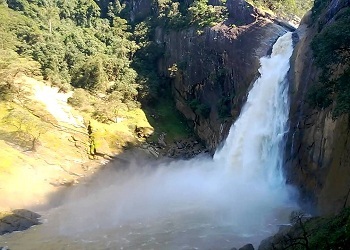 The falls are situated 3 kilometres west of the town of Talawakele on the Hatton-Talawakele Highway in Nuwara Eliya District. Aberdeen Falls is a picturesque 98 m (322 ft) high waterfall on the Kehelgamu Oya near Ginigathena, in the Nuwara Eliya District This waterfall is very beautiful and it is covered with a big stone complex behind. The waterfall is ranked as the 18th highest on the Island..